Algoa Bay is one of the South Africa’s largest bays, and richest thanks to the fact that it’s at the conjuncture of two oceanic systems, the Cape Agulhas and the upwelling current of the Benguela: two systems means two different ecosystems. The St Croix Islands are located within the bay and are home to a great number of bird species; Algoa Bay was declared an Important Bird and Biodiversity Area by Birdlife International in 2001. The bay is also home to the largest breeding colony of African penguins in the world, and has migratory humpback and Southern right whales visiting in the winter months. Another species you’ll definitely see there is dolphins, both bottlenose and common. Usually orcas also visit once a year. African penguin (Spheniscus demersus) This adorable creature makes a not-so-adorable donkey-like bray, which is why it’s also known as the jackass penguin. It’s endangered and is found in only a few areas along South Africa’s coast: Betty’s Bay (part of the Cape Whale Hope Spot), Simon’s Town (part of the False Bay Hope Spot), Algoa Bay (part of the Algoa Bay Hope Spot). 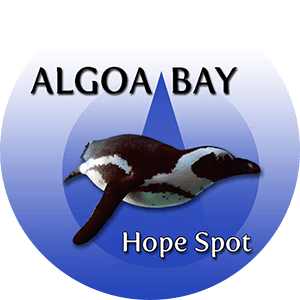 Every month, the Algoa Bay Hope Spot organises a series of talks called Know your Bay. See the Algoa Bay Hope Spot Facebook page for more. The NSRI, SANCCOB and others make presentations to children from dozens of schools, who learn about the wonders and dangers of the sea, at various times during the year. Watch FB and check nmbt.co.za for the latest details.